Some people say that black is an absence of color. This is a sample from my new 2014 Black Beauty class during which we create the cover of a journal. I will never get tired of playing with gels, inks and paints to get some texture magic going on.. I designed this journal having this particular idea in mind - it just had to be sturdy enough to endure all the mixed-media action I'm so passionate about. Obviously, there are lots of heavy embellishments involved and during this class we end up with one-of-a-kind creations to prove that black can be beautiful, too. Never flat, never dull! Amazingly deep and iridescent! 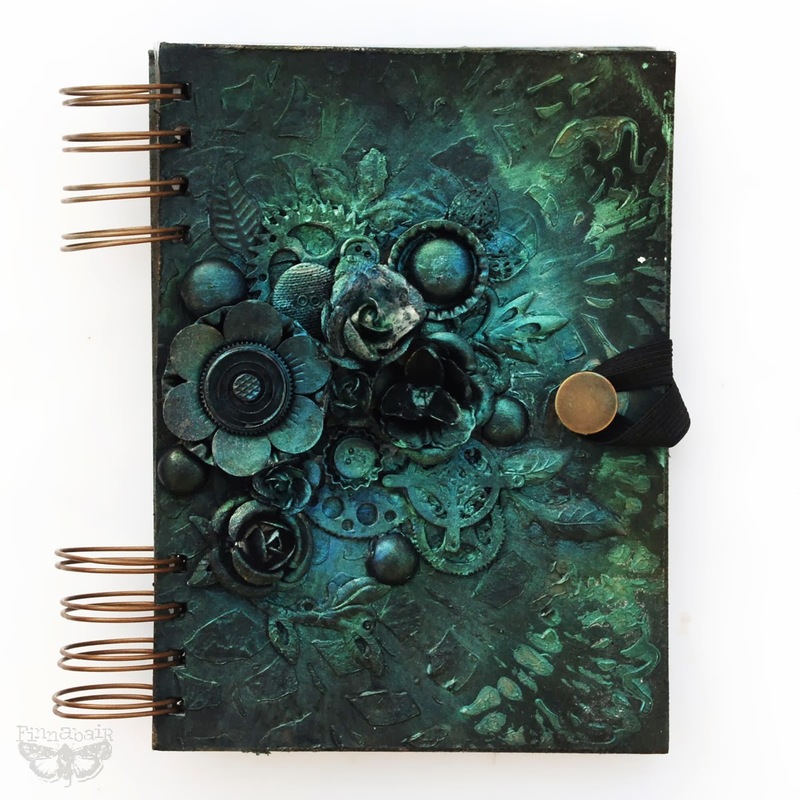 You can find the journals of my design (large & small) in our shop, there's also a wide variety of Mechanicals - my metal embellishments and all sorts of media to create the feeling of depth: my favorite Silks acrylic paints, Primary Elements pigments, inks of all different kinds and many more! I love it and no Black is not boring!! Awesome colours used!!! Miss Anna!! I'm seriously adoring that nice copper/brass color of the rings and closure on top of all the dark colors and black. YUM. I love black and totally love your journal cover! Black is beautiful! This is gorgeous!! I love it ! And booked this workshop at Scrapheap in May. Can't wait !! Your projects are always amazing! I made this Black Beauty at the Prima Artventure in California and it is my most Favorite thing I have ever made in a class! And I made an autograph/memory book from the event out of mine. It is a memory I will cherish forever! This is FABULOUS! Gorgeous with the colours over! Love black... I wear it and create with it. I love black, find it so dramatic-this is fabulous and definitely not boring!! I love black on a project. A little bit gives the perfect pop of contrast and a lot makes a wonderful dramatic statement! Your cover is stunning! Fabulous cover and love your black! Looking forward to attend your class again! I love see your projects, there are so amazing! I love black, and this is a stunning journal cover. Maybe you will be doing this in a class in Ireland sometime? Just stunning. I love black and white and black and yellow colour combinations but rarely use them in my crafting. I think I'll start now. Absolutely Finn - this is fantastic! Hopefully I'll get to take this class when you come to the US this summer! Love it Finn. Rich and sumptuous! I don't think I will ever understand how you create so many tones in your backgrounds! It's fascinating to look at.